The McDonald's Restaurant on the Champs Elysées is one of the best spots for people watching in Paris. It has a second floor seating area with a glass window overlooking the celebrated Arc de Triomphe. It helps to attract the number of pedestrian traffic but I think its dessert offerings from its McCafé section will keep visitors coming. Check out the photo of the pastry and cake selections. 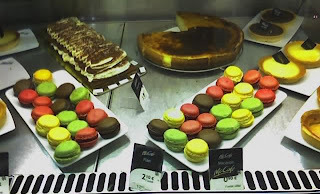 There are colorful macaroons (that appear like the big sisters of M&M chocolates), flan, various tartelettes (with apples, custard, with nuts) , and tiramisu. Mmmm! I chose a raisin pastry and a viennoise au chocolat. Responding to local cultural sensitivities, McDonald's restaurants in Europe have toned down golden arches signs. It helps to be understated in places like Paris where cuisine is elevated to an art form and worshipped and fast food is frowned upon. By the way, the McCafés I've been to in Italy, Spain and France do attract a large following. So does Starbucks.